(Nanowerk News) Atomic force microscopy, a tactile-based probe technique, provides a three-dimensional nanoscale image of a material by gliding a needle-like arm across the material’s surface. The core of AFM imaging workhorse is a cantilever with a sharp tip that deflects as it encounters undulations across a surface. Due to a minimum force required for imaging, conventional AFM cantilevers can deform or even tear apart living cells and other biological materials. While scientists have made strides in reducing this minimum force by making smaller cantilevers, the force is still too great to image cells with high resolution. 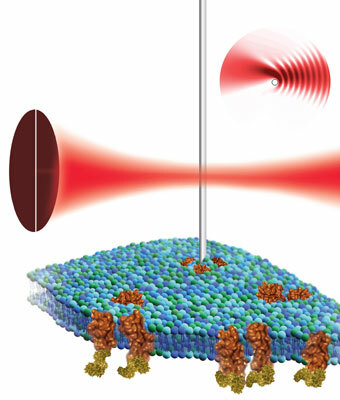 Indeed, for imaging objects smaller than the diffraction limit of light—that is, nanometer dimensions—this approach hits a roadblock as the instrument can no longer sense minute forces. Now, however, scientists with the Molecular Foundry, a U.S. Department of Energy User Facility located at Berkeley Lab, have developed nano-sized cantilevers whose gentle touch could help discern the workings of living cells and other soft materials in their natural, liquid environment. Used in combination with a revolutionary detection mechanism, this new imaging tool is sensitive enough to investigate soft materials without the limitations present in other cantilevers. Rather than measuring the cantilever’s deflection by bouncing a laser off it, Ashby and Sanii place the nanowire cantilever in the focus of a laser beam and detect the resulting light pattern, pinpointing the nanowire’s position with high resolution. The duo say this work provides a launching pad for building a nanowire-based atomic force microscopes that could be used to study biological cells and model cellular components such as vesicles or bilayers. In particular, Ashby and Sanii hope to learn more about integrins, proteins found on the surface of cells that mediate adhesion and are part of signaling pathways linked to cell growth and migration. “High sensitivity deflection detection of nanowires,” by Babak Sanii and Paul D. Ashby, appears in Physical Review Letters and is available in Physical Review Letters online. This work at the Molecular Foundry was supported by the DOE’s Office of Science.